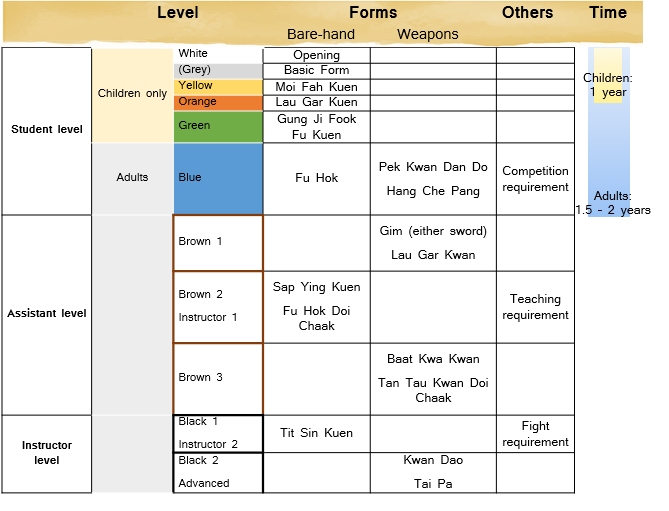 ​Welcome to the curriculum I use for teaching Hung Kuen kung fu, passed to me by Wong Chung Man Sifu. I designed it to clearly state the goals of my teaching, and the content. There are three types of goals, or even types of target groups, that this curriculum address: the health/joy population such as children classes, happy movers, fitness seekers. Fighting: such as self-defense, fighting fans and aspiring fighters who want to come from the traditional martial arts background. And those who would like to study more about Hung Kuen, interested in the extended system. ​This curriculum is an outcome of many years of my thinking, work and past curriculums. Thanks to my karate background I could experience the tidy curriculum of Shotokan karate and in my own teaching I always needed a similar approach with defined goals and methods. In kung fu in general, it is not that common that a style would have such clear stages, because the way of Japanese and Chinese style of teaching is different. I must admit that a full-contact combat experience (sanda, MMA, boxing) made a big difference in creating this, and I am grateful for that lead. This curriculum is a core of techniques and forms of the Hung Kuen style, which were carefully hand-picked from the enormous content of Hung Kuen. All other techniques are still taught in the forms, and forms that are not chosen as the core are still offered as part of the so called “extended system” for those, who wish to study deeper. ​This table is showing the flow of the curriculum, including levels. There is a difference between children’ and adults’ levels; kids learn slower and have several additional color levels before they reach blue. The very small ones (4-7 years old) have one additional stage (grey) to shorten the period between white and yellow. Adults are promoted, while children are tested. You could say that the basics are covered in the first two years, while reaching the blue level. At each stage, specific techniques and forms are taught. However, students can learn a form or a technique earlier, and it is common, but it does not mean that they have fulfilled the requirement of the level. The level is meant to be complex, not only about collecting forms and techniques. For example, stances are dosed during the several levels. But in fact, both kids and adults would learn all of them quite soon. What I however mean by marking some stances green and some yellow etc., is that at that point of time they (adults in particular) can understand, explain and apply the stance, its use in change of direction or power transmission. Several weapon forms are specifically designed for a level, all other weapons can be learned in various order. The core techniques are sorted according to the color stages. ​For example, for the white level, 3 specific stances, 2 hands attack and 1 kick are required. This is an illustration of the techniques list, the defense moves for the upper gate (defending the head).